Every LightRider Bridle comes with a printed manual, but to assist with the correct fitting and adjustment Cynthia Cooper has made some videos for those who like to see it in action too. This video shows how to attach the LightRider Bitless Noseband to any regular bridle to transform it into a bitless bridle, saving you money and allowing you to use a favourite (or expensive) bridle that would otherwise gather dust! This means you can use a bridle that you know fits your horse well. You may need one more hole of upwards adjustment in the cheek pieces. This video shows how to fit a LightRider English/Stockhorse/Western style bridle and the Bitless Noseband that has been put on a regular bridle. This video shows how to adjust the chinstrap on all of the LightRider Bitless Bridle styles. This video shows how to fit and adjust the LightRider Natural and Performer Rope bridles. 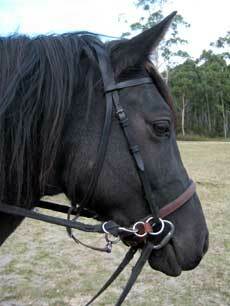 It is possible to use the bitless noseband with the bit still attached to the bridle. As you can see in the photo, the bit is underneath the noseband ring, with the chinstrap behind (not through) the bit ring. Some bit styles may not be suitable - the best are a French snaffle like the one shown, or a simple small ringed bit. This allows you to have two sets of reins - perhaps with the bit reins tied to the saddle so they don't slip around. They can then be ready to use if you feel its necessary. This can be a good solution to start with for riders unsure about how their horse will respond in different situations, or to comply with rules that state a bit must be worn.